African violets and their cousins  exclusively! NOTE: The Velvet Leaf is on a temporary hiatus. We regret that circumstances temporarily prevent us from providing the superior quality leaves our customers have always received. We’re sorry for the inconvenience, and we hope you’ll visit The Velvet Leaf this fall when we can again offer quality leaves. A special “thank you” is extended to our loyal customers for their patience and understanding. We offer show plants, starters, and leaves from America's most popular hybridizers, with their newest cultivars added to our stock each year. 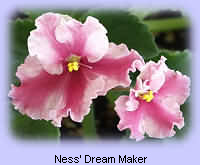 We look forward to providing you with the newest, highest-quality African violets and their cousins for your growing and showing pleasure! Watch our eBay auctions for some special surprises. 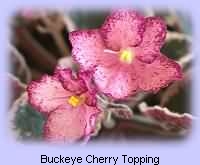 Want to know when we have new plants available? Click here to sign up, and you will be notified by e-mail whenever we post new arrivals. You may unsubscribe at any time.